antique sewing machine - Judkins "Domestic"
The JDSM Co. marketed the "Domestic" chain stitch in the UK during the mid to late 1860s. 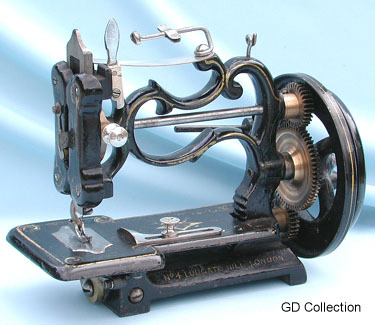 Probably imported from North America, this New England style machine incorporated several modifications over standard machines of this type. The most noteable was that the bobbin holder on the top of the needle bar was dispensed with, being replaced by a simple spindle attached to the rear of the main frame.